Visiting the Gulf Coast isn’t always about sunbathing on the beach, although those glistening white sands sure call our name this time of year, as winter skies clear and the temperatures rise. 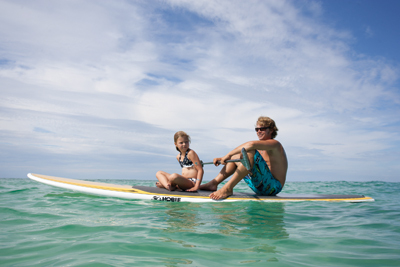 The Gulf Coast also offers numerous ways to get back to nature, including kayaking on inland dune lakes, paddleboarding and parasailing in the Gulf, hiking along winding terrain in a variety of ecosystems and much more. Here are some ways to explore the great outdoors of the Gulf Coast. The Florida panhandle’s South Walton area offers a 26-mile stretch of neighborhoods such as Sandestin, Seaside and Rosemary Beach, but it’s also home to four Florida state parks and Point Washington State Forest. In fact, 40 percent of South Walton is owned by the state of Florida and protected from future development. That means there’s plenty of hiking, horseback riding, biking and more in areas where bird calls and waves are the only sounds. One of the greatest hidden treasures of South Walton is 15 coastal dune lakes, a unique feature created by wind and waves thousands of years ago. These unusually shallow lakes and surrounding dunes happen in only a handful of places and make for wonderful kayaking opportunities. The lakes build up with rising water from rain and stream run-off, then break through to the Gulf in a “blow-out” and close back up again. The result is brackish water trapping saltwater plants and animals along with fresh water creatures. Barbara McConnell of Carencro recently toted her kayak to the Florida Panhandle and reveled in what she found on Western Lake, one of the largest of the dune lakes at Grayton Beach State Park. “Gliding silently in my kayak through the clear but tea-colored waters of Western Lake is a unique experience because it combines the flora and fauna and the waters of both the seashore and the freshwater lake – one of the rarest spots on earth,” McConnell says. Several of the lakes exist within state parks and may be accessed by hiking trails. In addition to Grayton Beach, you’ll find them at Deer Lake State Park, Topsail Hill Preserve and Camp Helen State Park. A Florida fishing license is required to fish on the coastal dune lakes, and all lakes allow for motorized boats except for Topsail Hill Preserve. A century ago, before logging transformed the local economy, massive longleaf pine trees stretching heavenward dominated the local ecosystem. That early deforestation and today’s modern development have resulted in less than five percent of longleaf pines in South Walton. Visitors can view these mammoth trees, as well as other creatures and native plants, by hiking or biking through the eight-mile Longleaf Pine Greenway Trail of the Point Washington State Forest. Eglin Air Force Base above Navarre, Florida, offers miles of trails through diverse habitats as well. Visitors may enjoy longleaf pines as well as the unique bogs of carnivorous pitcher plants along the Eglin Trail, then head to the coast and traverse through sand dunes and coastal forests along the 29-mile Seashore Trail. The Pasagoula River in southern Mississippi is the largest, by volume, undammed river in the contiguous 48 states. The river and its tributaries are home to hundreds of species of birds, many of which migrate through in the spring and fall, in addition to animals and fish. Preserving and showcasing this important ecosystem is the reason why the Pasagoula River Audubon Center opened in Moss Point last year. The center serves as a launching point for McCoy’s Swamp and River Tours, a place where individual paddlers can also access the water, as educational outreach in its environmentally sustainable building and grounds and a showcase for the unique landscape. The complex includes a hummingbird garden, botanical garden of native plants and a fun children’s playground. There is even a historical building once used by Boy Scout Troop One of Moss Point, charted in 1919, where visitors may now rest in rocking chairs and view birds at feeders and in the wild. “It’s all about getting kids back outside,” says Director Mark LaSalle, who added that adults are welcomed, too. McCoy’s boat tours average about two hours and wind through the river’s old growth swamps and tidal marshes, led by captains who are master naturalists. For birders, check out the nearby Mississippi Sandhill Crane National Wildlife Refuge. The Mississippi Gulf Coast makes for wonderful getaways because it’s a quick drive and perfect for a weekend, shopping is diverse in Bay St. Louis and Ocean Springs, and the three restaurants below run the gamut between rowdy and fine dining. First, the place to let your hair down: The Blind Tiger in Bay St. Louis is a sports bar, music venue, restaurant and overall great place to soak up the sun while looking out at the sparking Gulf waters. Margaritas are delicious here, and there’s a nice selection of local beers. The menu offers fresh ingredients in dishes such as fish tacos, Mahi Mahi sandwiches and decadent hamburgers with handcut fries. Moving up a notch is Bacchus on the Beach in Pass Christian, where diners can enjoy drinks and appetizers on the deck overlooking the marina. Start with the Bacchus Brew, a delightful “boat drink” with orange flavors, or move inside for some royal reds, shrimp scampi or a variety of oysters at the brick-oven oyster bar. Bacchus packs them in on Mondays, when the special is pork chops, greens and cornbread for only $10. Sometimes you need to wash the sand from between your toes, gussy up a bit and enjoy fine dining when you’re visiting the coast. For that, there’s The Chimney in Gulfport, open for weekday lunch, dinner except for Mondays and Sunday champagne brunch. Seafood reins here, from lump crabcakes and seared tuna to just about anything swimming in Gulf waters. For more information about Mississippi Gulf Coast restaurants, visit GulfCoast.org. Historic forts, quartz-sandy beaches, campgrounds, barrier islands, hiking trails – it’s all part of the Gulf Islands National Seashore, which stretches 160 miles from Cat Island, Mississippi, to the Okaloosa area east of Fort Walton Beach, Florida. Twelve areas make up the preserve operated by the National Parks Service and include the islands off the coast of Mississippi and Alabama, Fort Morgan west of Gulf Shores and Santa Rosa Island from Pensacola to Navarre Beach. Visitors to Seashore have a host of outdoor activities to choose from, including biking, hiking, snorkeling, birding, camping and wildlife viewing. There are 35 miles of designated hiking trails in the Florida District, for instance, and camping at the Davis Bayou Campground near Ocean Springs. Fishing and boating are allowed in both the Mississippi and Florida districts, with restrictions, and swimming is allowed almost everywhere, although the five designated beaches may be preferable. Five of the barrier islands off the coast of Mississippi – Cat, East Shop, Horn, Sand and Petit Bois – are accessible by private boat. A passenger ferry leaves from Gulfport to West Ship Island, a barrier island that’s home to lovely beaches and the historic Fort Massachusetts. Visitor centers exist at Davis Bayou and Fort Barrancas, Fort Pickens and Naval Live Oaks in Florida, open daily except certain holidays. For information, a list of sites and upcoming events, visit NPS.gov/guis. There is so much to do at Gulf State Park in Gulf Shores, the big question will be where to start first. There are miles of beaches, an 18-hole championship golf course, tennis courts, biking trails, a nature center and rental cottages, so you don’t even have to leave at the end of the day. If hiking is your thing, there are seven trails through 15 miles of several ecosystems within the Hugh S. Branyon Backcountry Trail complex. In addition to Gulf beaches, there’s a pool and splash pad for overnight park visitors, and the Pool House has rentals, such as tennis rackets and horseshoes. Likewise, visitors can fish in the Gulf waters on the park’s new pier or on the freshwater Lake Shelby. For the adventurous, there’s zip-lining at Gulf Adventure Center or geocaching throughout the park. Accommodations range from 20 modern cabins and 11 cottages to 496 improved campsites with modern bathhouses. Primitive camping sites are also available. For information and reservations, visit AlaPark.com/gulf-state-park. If you only desire the emerald waters of the Gulf, why not try something new? Numerous outfitters on the beaches from Mississippi to Florida offer parasailing, jet skies, paddleboarding and scuba diving, in addition to kayak and canoe rentals. Visitors can experience a guided deep sea fishing excursion into the Gulf or join a dolphin cruise to spot the popular sea mammals closer to shore. Boogies at HarborWalk Village in Destin, for example, offers jet skis and parasailing in addition to glass bottom boat and pontoon excursions. And if all those suggestions still haven’t whetted your appetite for the great Gulf outdoors, there’s always sunbathing on the beach. There were two goals designing the GulfQuest Museum, the latest attraction in Mobile, Alabama. The museum had to showcase the entire Gulf of Mexico, considered the international doorway to the Americas, and almost everything had to be interactive. The result is a multi-million dollar 90,000-square-foot museum shaped like a massive ship beside the Mobile River. With 90 exhibits, a museum store, café and event space, it’s the first museum dedicated to the Gulf Coast’s rich maritime traditions, says Executive Director Tony Zodrow. Visitors start off with the three-screen, multi-media presentation, “The Gulf Coast: A Place Like No Other,” explaining the importance of the Gulf of Mexico and Mobile Bay from its early history to today. They are then greeted by a massive wall that resembles the deck of a container ship. As visitors make their way up the five floors of interactive experiences, they finish with stunning views of the river and Mobile Bay. Exhibits include hurricane simulators, navigation games, nautical knot primers, steamboat operating and much more. One not to be missed is the Ocean Planet exhibit, a six-foot earth suspended and rotating on its axis. Real satellite data provided by the National Oceanic and Atmospheric Administration is projected on to the earth, including historic paths of hurricanes and weather only days before. Watching the unusually busy hurricane season of 2005, centered by hurricanes Katrina and Rita, will amaze. Give yourself plenty of time to explore. Each stop along the way is hands-on fun. For more information, visit GulfQuest.org.